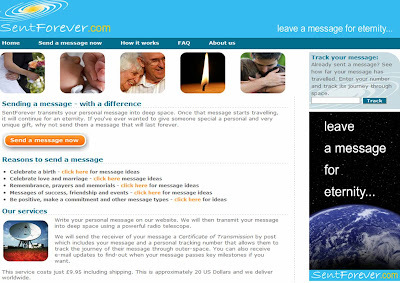 www.sentforever.com are "enabling people to send messages that are true commitments of love as they can never be cancelled or recalled." BT helped develop the technology and messages are transmitted into deep space from the BT Goonhilly Earth station in Cornwall. Messages then travel through space in radio wave form for the rest of eternity and whilst the signals get weaker as they travel, they will exist forever. Users write a personal message on the sentforever.com website. The receiver of the message is then sent a Certificate of Transmission by post which includes the message and a personal tracking number that allows the journey of their message through outer-space to be tracked. Users can also receive e-mail updates to find-out when the message passes key milestones. This service costs £9.95 including shipping and certificates can be delivered worldwide. Use of www.sentforever.com is not limited to individual users though. SFX magazine have also recently started using www.sentforever.com to become the world's first magazine to be sent into space! 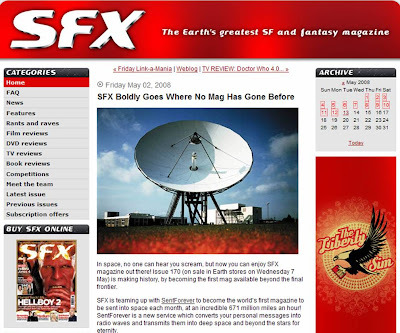 "From now on, each issue of SFX will be beamed via satellite into space at phenomenal speeds. Just a few milliseconds after transmission the signal passes about 450 miles above the French Mediterranean and will pass the orbit of Pluto and leave our solar system in a fraction over 5 hours." Message2Space.com does the same kind of thing...users can type in a message and have it beamed into space using powerful microwave transmitting equipment.